What is Main method in C#? Why Main method always declared with static? How to use Main method in C# programming? In C# programming the Main method is where program starts execution. It is the main entry point of program that executes all the objects and invokes method to execute. There can be only one Main method in C#. However, the C# Main method can be void or int return type. It must be inside a class or struct and must be declared with static modifier. It is the main place where a program starts the execution and end. The Main method can have a parameter and these parameters are known as zero-indexed command line argument. In lateral chapter you will learn more about command line argument. Note: To see the execution of program step by step, press F11 step by step. Why the main method is always declared with static? The Main method in C# is always declared with static because it can’t be called in another method of function. The Main method instantiates other objects and variables but there is no any method there that can instantiate the main method in C#. On another hand, the main method doesn’t accept parameter from any other function. It only takes a parameter as an argument via command line argument. In this chapter, you learned about what is Main method in C# and why it is always declared with static. You also learned how to use the main method in programming. 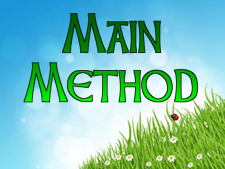 In next chapter you will see some programming examples of method.